For fans of the once-mighty peanut butter & jelly Pop-Tart, it's been a hard few decades. The goods were cruelly ripped from shelves in 1986 without so much as a farewell tour, and since then, no one's heard a word from the beloved pastries. But after dropping two strictly-PB flavors last spring, Kellogg is looking to make all your breakfast-based dreams come true with the national launch of Frosted PB&J Strawberry Pop-Tarts. There were whispers of the return in Walmart last month, and now the latest addition to the "Gone Nutty!" line is available across America. Each toaster treat boasts a classic peanut butter and strawberry filling, along with extra PB frosting and sprinkles on top. The suggested retail price for a box of six is $2.59, and considering the hordes of nostalgic thirty-somethings (plus actual kids) who are lying in wait for these things, don't be surprised if your local shop sells out. In fact, you better go buy a box ASAP -- grocery stores always deprive us of the most important foodstuffs in the colder months. Kristin Hunt is a Food/Drink staff writer for Thrillist. 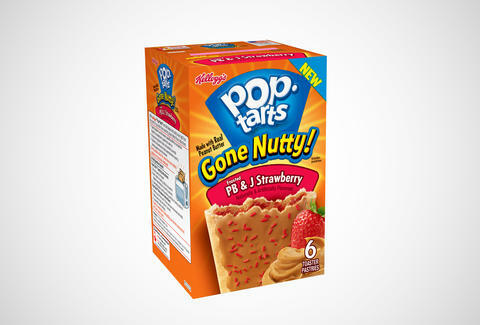 The original PB&J Pop-Tarts were before her time, but she would've been all over those things. Follow her at @kristin_hunt.